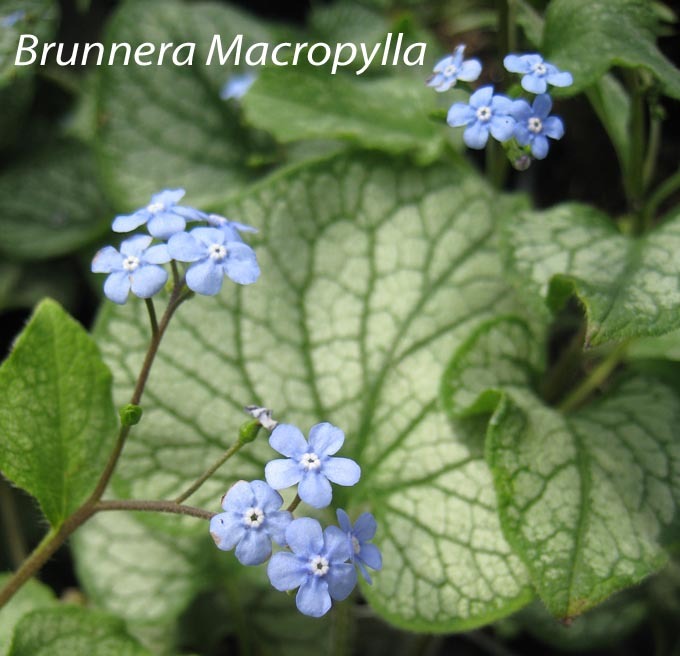 An outstanding treasure of the plant world that few know about is Brunnera macrophylla. This azure blue flowered plant is one representative of Forget-Me-Not hence the common name Siberian Forget-Me-Not. Brunnera is native to West Caucasus and Siberia and was introduced to Europe in 1713. The true blue flower rises above soft green foliage in early spring and ushers in the new season. As the season progresses, the heart shaped leaves enlarge in size and create sizable specimens that are tailor made for shady gardens. New cultivars of Brunnera feature variegated foliage and are proving very popular. Two recent introductions, ‘Looking Glass’ and ‘Jack Frost’ display a beautiful silvery patina across the large heart shaped leaves. Brunnera ‘Variegata’ was the first of the variegated forms with a white border on the green leaf and there are now innumerable cultivars to choose from. Brunnera is useful in many situations and is perfect beneath shrubs or in shaded or partly shaded flowerbeds. It can be used as groundcover and will not take over an area aggressively as many groundcovers do, although it does self-sow prolifically if the faded flowers are allowed to form seed. In our Colorado climate, Brunnera grows best in shade or dappled light. Amending soil with compost is recommended and watering moderately especially in dry periods is about the only maintenance required. Brunnera is completely dormant in the winter with no foliage on view, but it is early to appear every spring with the unmistakable blue of the forget-me-not. It demands little and pays big dividends to the pennywise gardener. Find a local independent retail location at www.coloradonga.org, click on ‘find a member, ’ and search any section. Previous Story: Third Street a city dump?